Goodbye, Marshall Field’s. Goodbye, Famous-Barr. Goodbye, The Jones Store. Goodbye, Robinsons-May. Goodbye, Meier & Frank. Goodbye, Foley’s. Goodbye, Strawbridges. Goodbye, Kaufmann’s. Goodbye, L.S. Ayres. Goodbye, Filene’s. 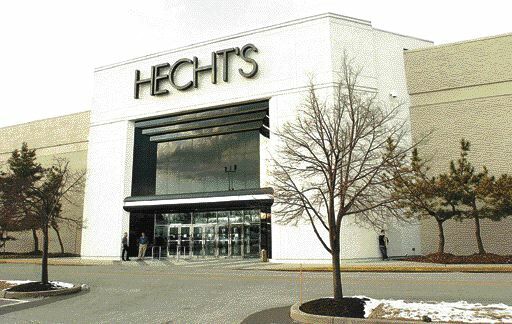 Last but certainly not least, goodbye, Hecht’s. You all no longer exist and are all now Macy’s. On Saturday of this past weekend, September 9, 2006, all of those brands officially became Macy’s, along with countless others which have been swallowed up and converted to the Macy’s nameplate over the years in order to form this national brand. While many are in uproar and upset about *their* local store disappearing and while no single store to my knowledge has ever converted this many brands at once, this is not a new phenomenon. I just read the story of Macy’s and, like the history of many chains, it’s an interesting read full of ups and downs, brutal takeover attempts, a devastating shipwreck in icy waters on the high seas of the North Atlantic, and many different department store chains along the way. Since Macy’s currently operates in 45 states (you in Alaska, Arkansas, Iowa, Mississippi, and Nebraska are going to start feeling left out), odds are you have a Macy’s near you. And, since Macy’s just added 330 stores this last weekend to make 850 stores in total, chances are that although you might have heard of Macy’s, you may have never actually been to one. (Who am I kidding, the people who read this are probably well aware…) anyway, here we go. Macy’s was founded by Rowland Hussey Macy in Haverhill, Massachusetts. Quickly, Macy moved his company to various locations in New York, lasting almost 40 years on the corner of 18th and Broadway. In 1896, Macy’s was acquired by Isidor Straus (who later died aboard the RMS Titanic) and his brother Nathan. They moved Macy’s into its current digs on the corner of 34th and Broadway. The store got bigger and bigger and eventually enveloped nearly the entire block. However, one Brownstone house right on the corner of 34th and Broadway held out and reportedly charges Macy’s exorbitant rent to this day. You’re all familiar with the house, you just don’t know it. It’s covered by a giant red bag which reads “The world’s largest store” – and it is the world’s largest store at over 2 million square feet of selling space. That’s larger than over 90% of the shopping centers in the country. Throughout the next few decades, Macy’s was in the business of expansion. They opened satellite locations in Kansas City, San Francisco, Toledo, Atlanta, and other cities. They acquired many smaller chains such as New Jersey based Bamberger’s in 1929. But, in the 1980s, Macy’s bit off more than it could chew and was in dire financial straits. In 1985, it divested itself of its midwest locations in Kansas City and Toledo, exiting the region for nearly 2 decades save for a lone store at the Mall of America in Minnesota which opened in 1992. In 1986, Macy’s ended the long-term operation of a name it owned in New Jersey and the mid-Atlantic states by flipping the Bamberger’s nameplate to Macy’s. Also in 1986, a takeover battle of epic proportions ensued, as Macy’s CEO Edward Finkelstein became engaged in a vicious takeover battle with a Canadian company over the much coveted Federated Department Store chain. This is where the story gets interesting again (and maybe a little confusing) but we’ll iron out all the details. Finkelstein lost the hostile takeover bid in 1986; however, as a result, he got some of Federated’s booty, California’s Bullocks and I. Magnin chains. In the early 1990s, there was trouble in paradise as the Canadian company which acquired Federated declared bankruptcy. 1992 also saw trouble for Macy’s which declared bankruptcy of its own right. In 1994, it seems as though these two bankrupt entities would be a match made in heaven and Federated acquired Macy’s. Finally Macy’s and Federated were one. Immediately following the merger, Federated chose to shutter the entire upscale I. Magnin chain in California, converting many to the Macy’s or Bullock’s nameplate. Federated also chose to fold the Abraham and Straus nameplate in the New York area and the Jordan Marsh nameplate in the Boston area into Macy’s in 1995 and 1996, respectively. Feeling hungry, Federated marched on, attempting and eventually failing an acquisition of the bankrupt Wanamaker/Woodward & Lothrop chains in the mid-Atlantic region. Instead, it acquired the Broadway/Emporium/Weinstock chain of California and folded those chains as well as the Bullock’s locations they already had into the Macy’s nameplate. Fast forward to 2001. Federated dissolved its Stern’s nameplate and many of the stores became Macy’s. Also in 2001 the Liberty House chain of Hawaii and Guam were acquired by Federated and flipped to the Macy’s nameplate. 2003 saw one of the biggest leaps forward for Federated-Macy’s, as they chose to rebrand its stores in the Pacific Northwest (Bon-Marche), Memphis area (Goldsmith’s), Florida (Burdines), and the Ohio Valley region of IN/OH/PA/KY/WV (Lazarus) to Macy’s. The branding was gradual, with each store given a hyphenated “-Macy’s” suffix for 2 years from 2003, culminating with just Macy’s in March of 2005, effectively eliminating those brands forever. Now we’re almost up to date to the biggest merger in Federated-Macy’s history, with May Company in 2005. This merger happened in February 2005, effectively creating the second largest department store chain behind Sears with over $30 billion in annual sales. (For those still paying attention, May Company was the parent at the time of all the stores which just converted to Macy’s last weekend.) 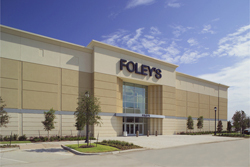 In July 2005 the death knell was raised against the stores of the May Company chain as Federated announced that based on the previous successes they had converting regional nameplates to the Macy’s name (see previous paragraph), all May chains would be converted to Macy’s or Bloomingdale’s. Federated announced they wanted to create a national department store brand in Macy’s and they finally had the stores to do so, so they began store conversions on the 10 May brands during the Summer of 2006. First, Macy’s gift cards started appearing, then some of their banners and advertisements and finally, the signs came down and big red stars went up everywhere. Last Saturday, September 9, was to be the official full conversion. As I alluded to earlier in the post, many are upset at this drastic change in retailing. In fact, over 50,000 people have signed a petition to keep Marshall Field’s, and there are also T-Shirts for the cause. But as you can see, department stores are a changing animal, getting swallowed up or vice versa and it’s really all in flux. My two cents? I feel that Macy’s has its work cut out for it. A tough road ahead, but majorly unprecedented successes if they can pull it off properly. I personally value variety in the marketplace and feel that it’s not only cool to go to a distant city and see different stores, but it probably bears upon the quality of service, variety, and prices. On one hand, people are loyal to stores which have heritage in their area. It’s purely topophilic, but what better marketing campaign does a store need to have than being tied to a particular place? On the other hand, the logistics of having a unified national brand is certainly more cost-effective and easier to manage. There have already been problems with the merger. In Chicago’s flagship Macy’s on State Street, a group of backlit signs improperly labelled the streets and avenues which bound the block where the store sits. Locals, who are still reeling from the loss of their Marshall Fields, were quick to point out the snafu and how they feel Macy’s is spread too thin to care about them as customers. I went to Woodfield Mall in Chicago and saw several people wearing T-shirts they purchased on ebay which indignantly stated “Chicago shops at Marshall Fields NOT Macy’s” – What’s in the future for these stores? Time will tell, I suppose. I hate to be a nitpicker, but you misstate the history of Bamberger’s–Macy’s bought it in the early 1900s and allowed it to operate under it’s own name until the late 1980s. Many in NJ called it Bam’s….is there an affectionate nickname for Macy’s? Rowland Hussey Macy (1822-1919), of the New York City department store fame, got his start in the retail business by opening his dry goods store in downtown Haverhill in 1851. Macy’s store was located on Merrimack Street. Macy’s first parade was not in New York City as most may think, but was held in Haverhill on July 4, 1854. It was too hot that day and only about 100 people turned out to view the parade. Macy’s policy for his store was “His goods are bought for cash, and will be sold for the same, at a small advance”. In 1858 Macy sold his store and with the financial backing of Haverhill’s Caleb Dustin Hunking, he left Haverhill to open a new store in New York City. In 1849, Rowland and his brother Robert were lured to California by the promise of gold. The brothers soon learned, however, that selling dry goods to hopeful miners was somewhat more prosperous than panning for nuggets in a stream. They came to Haverhill and in 1851 opened a dry goods store at 91-106 Merrimack St., where several businesses, including the A-1 Deli, are now located. At the time, Haverhill was a booming city, and its shoe industry was just beginning. A year later, the R.B. Macy store, also called the Haverhill Cheap Store, moved to new and larger quarters at 68-74 Merrimack St., where businesses, including the Angel Care Sensory Center, are currently located. During his time in Haverhill, Rowland Macy was a boarder in the Merrimack Street home of Caleb Dustin Hunking, a wealthy shoe and leather merchant who was destined to play a role in Macy’s future successes. The house they lived in was later moved to its current location at 160 Main St., across from City Hall. With Hunking’s financial backing, Macy launched R.H. Macy & Co., a dry goods emporium, in New York City in 1858. By the time he died in 1877, it was a full-fledged department store, noted for a variety of marketing innovations, including the first in-store Santa Claus. Aside from all that, the most interesting thing I read on these sites is that the Macy’s red star logo derives from a tattoo R.H. Macy got when he was whaling. Macy’s historically comes from Haverhill? Wow… interesting. Haverhill is like the city time forgot. I can see it bustling way back then, though. This name change thing really is about change. For anyone to walk around expressing their opinion on their back is fruitless. Macy’s has already made their decision and it’s done. We can’t do anything about it. Shop somewhere else if you don’t like it. Oh, except there isn’t anywhere else to shop anymore! So Macy’s acquired them in the 1920s and just flipped the nameplate in 1986, thus ending the Bamberger’s reign. Bob: That’s a great picture of the first Macy’s store and it’s fascinating the entire empire can be traced back to Haverhill. Maybe you’re related to R.H. himself! Anyway, its mindblowing in some ways to now think that 16 former local department store brands(many with more than a century of existance) have all been wiped out(including the 5 converted last year that Federated already owned at the time, which were Goldsmith’s, Rich’s, Burdine’s, Lazarus, and Bon Marche), thanks to Federated’s move to combine them as one brand. I don’t by any chance know what was going in Terry Lundgren’s mind by deciding to combine all 11 May nameplates into the Macy’s brand(as I still have mixed feelings about the dropping of the Marshall Field’s nameplate, as I did with Rich’s), but it’ll be interesting to see what the sales figures and stock price are a year from now, and compare it to now(and to 2005, when the Rich’s nameplate was changed over). Finally, how many family-owned dept. store chains are still left in operation, besides Von Maur, Belk, and Boscov’s? I’m only aware of these 3, from times when I’ve read up on entries about dead malls and various store chains in existance(+ past ones). I was too late to get photos of the original Foley’s signs before they were removed. I also missed getting photos of the Sanger-Harris signs before they were removed. This building was originally a Sanger-Harris. Don’t forget about Gottschalk’s. It’s still family-owned. My new Macy’s looks and feels suspiciously like my old Hecht’s. Ugh. Way to flop! And for the record, I was/am against changing all of the names over. Heck, I could have lived with Rich’s-Macy’s (shudder) or Field’s-Macy’s. They could have printed and filmed ads saying just “Macy’s” and probably been okay. I’ve been seeing the new Macy’s ads on TV here in Madison, Wisconsin (which had a Fields store for the last 20 years) – anyone else find them sort of patronizing and lame? They show all these different regions of the country, and tell you that you probably have Macy’s now. The websites of all the chains they ate (ie. Fields.com) contains the following pictures in the background relating to new stores: palm trees (CA, FL), the St. Louis arch, the Sears Tower, the Seattle Space Needle, and I think the Chrysler Building in New York. They forgot some of the other brands, I guess, but we get the point. I guess Indianapolis, Kansas City, Boston, Pittsburgh, Kansas City, Philadelphia, Washington and Houston don’t have recognizable enough landmarks. They could have put the White House on there, I guess. That would have been funny. Way to pander. Wow, defintely some mixed thoughts about this myself. Being Canadian, we don’t have Macy’s here. I kinda wish they would expand to Canada but I don’t see that happening. I wonder if maybe the past struggle with Canadians that you mentioned in the store’s history is a part reason why they avoided Canada altogether. It looks to me though as now there is going to be a major lack of variety (although, if all those stores that Macy’s took over were owned/operated by the same company, maybe there was never any real variety in the first place, they all sell pretty much the same stuff anyways right?). Its gonna be Sears, Macy’s or JCPenney, is that right? The United States does have, and even continues to have, more midrange department stores than Canada does, for some reason. It’s true that now Sears, JCPenney, and Macy’s will be the most common and the only truly national chains, but there are still some other big names: Dillard’s, Belk, The Bon Ton, and Boscov’s are just a few examples, but none have truly national coverage. And again, there are ones that skew a bit more discounty or a bit more upscale (say, Kohl’s at one end or Nordstrom at the other). Plus I think we’re really shifting to a place where Target is in many ways the archetypal, universal mid-range department store of the 21st century, rather than a true “discount” department store. All of the above chains had been owned by the May Company for some time, and were all very similar. Some chains were more alike than others (Kaufmann’s and Filene’s were identical in name only, but some other chains had wider differences) so the only real difference is in losing one big competitor. Still, most of those old nameplates had established legacies in their regions, and had developed a lot of loyalty over the years. Boston has had Macy’s for a decade (since they bought Jordan Marsh) but Macy’s has never had the cachet that our own Filene’s enjoyed. If a mall had a Macy’s and another nameplate, usually one store would be shuttered. Take, for instance, most Indiana malls. Many of them had Lazarus (which converted to Macy’s in 2005), as well as LS Ayres. In several cases, the Lazarus-turned-Macy’s would be closed, and Macy’s would move into the former LS Ayres store. Glenbrook Square in Fort Wayne and University Park in Mishawaka both featured a Marshall Field’s (former Hudson’s) and an LS Ayres; in those cases, Macy’s took the old LS Ayres and the Marshall Field’s location was closed. It’s funny all this brouhaha over the Macy’s changeover. Most of these May names were only in name only as the May Stores had a national scheme of their own anyway. That’s why our Famous-Barr store looked suspiciously like a Robinsons-May or a Hechts. They had also been doing this for at least 75 years. When May Stores bought Hamburger’s Department Store in Los Angeles in the 1920s, they changed the name to the May Company. When they bought Daniels & Fischer in Denver in 1957 they renamed those stores May D&F. After they acquired J.W. Robinson’s in the late 1980s, May combined it with May Company to form the very awkward sounding Robinsons-May. I had always assumed that one day they would change all of the names to May Company anyway. I am going to miss the Marshall Field’s name up in Chicago, but at least Macy’s is keeping the State Street store open unlike what the Bon-Ton is doing with the Carson Pirie Scott store on State, which is the real travesty. Am I the only one who finds it extremely funny that Macy’s runs TV ads depicting the Sears Tower in Chicago? Yeah, most of our “beloved” department stores have chomped up quite a bit of real estate, including other beloved department stores – someone else’s. It’s irrational to hold any value to them, but eh, we’re human. Besides, homogeneity in retail is pretty boring. Yeah, that is pretty funny considering that Sears and JCPenney are their major enemies now! Weel, about the Sears Tower: it’d be funny if Sears still occupied the building, but the company moved to the Chicago suburbs years ago. 1. Re: Robinsons-May. After May purchased J.W. Robinson’s, they ran the two chains separately. Robinson’s was much more upscale than the May Co. Eventually they combined them to Robinsons-May, only after many years as separate entities. 2. Re: Macy’s in San Francisco. Macy’s didn’t start their own store their from scratch; they purchased an existing store, O’Connor-Moffat. This became their West Coast flagship store, and remains so to this day. 3. Re: Two stores in the same mall. In some malls, they have converted or will convert, one of the stores to “Men’s and Home” and the other will have all of the other departments. That’s been very common in the past with two related stores in the same mall first when Macy’s and Bullock’s were combined and then when Federated took over the Broadway chain, then again and when May ended the Robinson’s and May dual nameplates. But if they feel that they can’t justify two stores, they’ll just dump one of them. I’ve noticed that they seem to be reloacting to old May locations rather than remaining in existing Macy’s locations in a lot of malls, perhaps because the May sites were either larger or newer or both. Here in Chicago we are fighting Back. 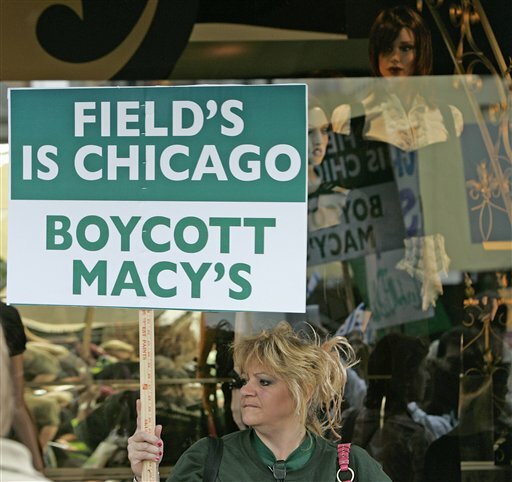 After Federated Dept Stores was handed some 50,000 signatures , from Keep-it-Fields website, Federeated changed the Historic Marshall Field’s Name to Macy’s anyway.They IGNORED US ! On Sept.9th,2006, some 300 Protesters gathered at the State Street Marshall Field’s Flagship Store, to Protest the Name Change. When Marshall Fields first opened his store in Chicago, there were 7000 people waiting in line for the Grand Opening . On Sept 9,2006, Macy’s lines only had appox 75 people in line when their doors opened. The Protesters are continuing to BOYCOTT MACY’S this Holiday Season, by encouraging fellow shoppers to Shop elsewhere ! Hurt them with your Wallet ! According to some Macy’s employee’s , “There are Bags and Bags of Cut – Up Macy’s Credit Cards , being sent back in Protest of the Name Change. Chicago’s Tourisum has been hurt by this Change also. Everyone stops in at Marshall Fields around the Holidays, to see the decorated windows, Have Lunch under the GREAT TREE, Shop for that Special Someone Gift, because if you received a Gift from a Marshall Field’s Store it meant you were Special. While I do appreciate your attempt to keep your local department stores familiar name by boycotting all Chicago areas Macy’s stores I’d highly doubt you’ll get Macy’s to change back to the Marshall Field’s name. Hell, I’d love to see Connecticut bring back the legendary G.Fox name,before it was bought by Filene’s in 1994. But that would mean we would have to boycott Macy’s over something that happened at least 12 years ago. If I remember correctly wasn’t their a time when Filene’s was boycotted when the first news of the G. Fox buyout was announced. Never the less good luck in all your efforts,and I hope you succeed. Does anybody think that making Macy’s a national brand was worth the eradication of all these stores? If Macy’s had went out of business (back when it was in bankruptcy in the early-1990’s), most of these stores would probably still be around today, and American retailing would be so much better off. This is old news here, but Macy’s killed BOTH of Atlanta’s chains: Davison’s (1985-1986) and Rich’s (2003-2005). Both were interestingly co-branded in the process: Davison’s/Macy’s and Rich’s-Macy’s. Both were advertised as such as well. The Rich’s-Macy’s hypenization was particularly evil, because the store was deliberately downscaled to Kohl’s levels during that time to destroy all customer loyalty to Rich’s. It was then returned to normal after it became just Macy’s. The difference between Davison’s and Rich’s was that Davison’s was owned by R.H. Macy all the way back to 1925 when it purchased the Davison-Paxon Company. I have surmised that the acquisition was that the Davison-Paxon group could not afford to build the huge downtown store needed to compete with Rich’s. Davison’s shedded its skin to expose its Macy’s core and lost all of its local flavor the same day that Bamberger’s vanished in 1986. Davison’s also was used just prior to try to save the flagging La Salle’s chain in Toledo (another R.H. Macy store). Keep in mind that the 1985 Macy’s lot included Davison’s, Bamberger’s, Taylor (KC), LaSalle’s (Toledo) and Bullock’s (CA). Rich’s was family owned until Mr. Rich died in 1976 with no suitable heirs, and the company struggled very hard to compete and expand when he was alive. The loyalty to Rich’s in those days was probably only eclipsed by Marshall Field’s. Rich’s was not a downscale chain, either. It was a much more elegant store more in line with Nordstrom in apparel. It was a very reverenced store, and it was the population growth of Atlanta combined with a nearly 30 year decline of the store explaining why it is not as well remembered today. When he died, the Rich family empire included not only Rich’s in both Atlanta and Birmingham but also the Richway discount chain. Federated took Rich’s down in a hurry…it never really recovered and a major reason that there was no major outcry over Rich’s vs. Marshall Fields was that Federated callously closed and let them partially demolish the humongous downtown store in 1991. Native Atlanta’s (like myself) continue to carry bitterness about it. I stubbornly call all the stores in Atlanta by their old names as an act of defiance (and weirdness I guess), and it does get me some attention. The Richway one can get funny, though. I get a kick out of saying I’m at the “Super Richway” (I wish). Back to Davison’s: the Davison’s flagship lasted much longer than Rich’s (on famous Peachtree Street), but struggled before finally giving up in 2003. Davison’s was much more spread out than Rich’s initially, but much less prominent in the Atlanta area. Every mall in Atlanta but two had either a Rich’s or a Richway while Davison’s did not really expand much in the malls until the 1970’s. Davison’s, however, was in several other cities in the state as well as in downtown Columbia, SC. It was an interesting chapter, but it all was sad in the end where we lost our identity completely in terms of stores to Macy’s-similar to how other major cities lost multiple chains to Macy’s. Retail couldn’t be more dull than it is in Atlanta now with Parisian’s failed Atlanta expansion giving us a returning Belk as the only real difference-but we already have lower-end Belks surrounding metro in the strip malls and I’d say we’re already over-Belked. It’s ironic, though, since years ago we had a much more downscale store known as Belk Gallant, and now they’re back ready to take on the ghosts of Rich’s and Davison’s. It’s almost comical now seeing that Atlanta’s big two are a shell of their former selves. 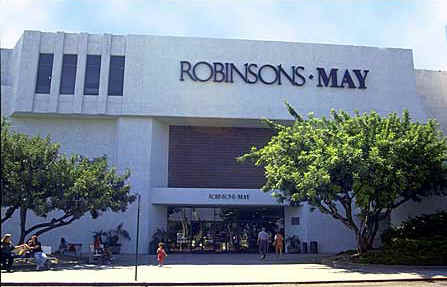 In the Fashion Show Mall, the former Robinsons-May is a Macy’s as well as the present Macy’s. They also dont have the departments split, they are both 2 full-size Macy’s, just without a Home department, which is found down the street. The only difference is that one is treated like a flagship with ThisIsIt, while the other one is just a little darker. Minneapolitans aren’t too shook up by all of this–when Dayton’s was converted to Field’s in 2001 was the real blow. Same thing happened to Hudson’s(based in Michigan) in 2001 when they were switched to Field’s(along with Dayton’s, due to Target/Dayton Hudson owning both chains, + Marshall Field’s at the time). Though I grew up in Chicago(and that this closed just right after I was born in the early ’80s), it’s sad I never got to see the original Hudson’s store in downtown Detroit, which I’ve read a lot about over the years(and it seems like it probably was up there with other well-known classic downtown department stores, a la the original Rich’s store in downtown Atlanta, Marshall Field’s in Chicago(State Street), etc.). Well, Federated today released its February sales report, and Same Store Sales for that month were up an anemic 1.2%. Compare this to January’s SSS which were up 8.6%. What explains this huge difference? Well, quite simply, February was the first month that the SSS figure included the former May Company locations. Obviously, if you do the simple math, the SSS at the former May locations must really be tanking. And I, for one, could not be more thrilled! I HATE HATE HATE HATE Macy’s for how it took control of more than two dozen beloved local retail chains (over the past 21 years) and want the store to fail. For the second month in a row, Federated reported poor Same Store Sales numbers: March’s SSS were up only 2.3%. Obviously, Macy’s is struggling with its 400-plus stores that were once owned by the May Company. And guess what the excuse given by Federated’s CEO was: he blamed the weather, just like he did last month. Nevermind, however, that despite the “poor weather,” Nordstrom’s SSS were up 15.0%, Target’s SSS were up 12.0%, and JC Penney’s SSS were up 10.6%. I wonder what the excuse next month will be. Unfortunately, Federated will never admit that getting rid of all the May Company’s chains was a mistake. I apologize for sounding like a broken record, but things are getting even worse for Federated. Rather than posting anemic increases in same store sales–as has been the case for the last two months–Federated’s SSS for the month of April were DOWN 2.2%. In fact, the biggest retail news story so far this year is how badly Macy’s is floundering at its former May-owned stores. It turns out that instead of shopping at Macy’s, the former May customers (aside from Marshall Field’s customers) are flocking to JCPenney. And, in the case of the former Marshall Field’s customers, they are flocking to Nordstrom, Von Maur, and Carson Pirie Scott. Max, I don’t know about how your local Macy’s is doing business, but at the closest store to me, it is doing just the same as it was when it was originally Kaufmann’s. I’m sure at markets which were devoid of Macy’s stores, they will do just the same or even better than in areas where there have been stores established for several years now. Another factor is the time in which the stores were converted. I believe that the stores should’ve been kept under its former nameplate for a little longer, and even rename the stores as Kaufmann’s-Macy’s, Filene’s-Macy’s, Marshall Field’s-Macy’s and so on. When department stores such as Lazarus and Rich’s were going through the conversion to Macy’s, that’s what was implemented. I feel that Federated wanted to get the Macy’s name out quickly because they assumed that the name alone is what was going to bring people into its stores, without determining that a Kaufmann’s or a Marshall Field’s store is going to be exactly the same no matter what they rename it to. Other than receiving cosmetic changes and new merchandise, the stores appear the same to me and there is no difference whatsoever between the new Macy’s and the old Kaufmann’s. Honestly, loyalty for a retailer has no place in the business. I think they realize that people will go there to shop regardless of the name if the merchandise is of the best quality and the prices are reasonable. That’s not to say that a more upscale retailer such as Nordstrom would simply move into a vacant Macy’s and set up shop there. They plan on opening a new location at Ross Park Mall in Pittsburgh and plan on demolishing the former Macy’s which still stands to this day. Macy’s is dull thats all there is to it they’ve barely changed their image after the merger. I hate hate hate Macy’s. In my mall, the brick is dark, as it was built in the early 1980s. Anyways, the 2-story Foley’s, the only 2-story mall section, when it became Macy’s, it was black-on-brown, and it looks awful. It’s funny how, before the merger, people were saying how Macy’s would be so much better than May. They said May stores had lower end merch. with a “the SALE you’ve been waiting for’ every weekend. Although the macy’s stores do seem less cluttered than when they were ‘May”, and the merch. does sem to be a little bit more fahionable, Macy’s has endless sales going on. Now, I love a sale just as much as the next person, but it feels like the old ‘May’ with the annoying advertising about the endless sales events. And yes, in 20 years, every store selling anything will be merged into “the Store” for our convenience. i’m sure there’s no relation *cough* but did anyone notice that aside from macy’s, the red star also represents communism? any relation there? hmmm…. Just don’t shop at Macy’s if you don’t like it. Some people do like Macy’s. The 2 stores in my city that Macy’s bought is not THAT bad. There is hardly any major difference that I can see. And they send a lot of coupons in the mail and have 10% fridays every so often if you use your Macy’s card. No one is forcing any of you to shop there. Ultimately the free market will decide if Macy’s survives. If the company is able to provide quality products, good service and reasonable prices, people will continue to shop there and they will survive for many years to come. And if the stores are as bad as you all say, people will stop shopping there and they will go out of business. And don’t say that just because they have over 800 stores now after acquiring May Co that they have no competition. There is still plenty other department stores to choose from: Dillards, JCPenney, Sears, Mervyns, The Bon Ton Stores, Belk, Kohls, Lord & Taylor, Stage and Bocovs. The higher end department stores as well like Nordstroms, Neimen Marcus, Saks Fifth Avenue, Von Maur and even there on Bloomingdale division are more competation. And other specialty houseware stores that sell some of there other products like Bed Bath & Beyond & LinenNThings. Not to mention that most Macy’s are connected to a mall or lifestyle center filled with many stores selling a lot of the same merchandise. Look how many regional department stores Dillards acquired in there expansion from the 70’s through the early 90’s. The transitions were probably filled with problems for the first few years with selling and trading stores in overlapping malls, and closing underperforming or older stores, especially when they acquired the Mercantile Stores in 1998. But eventually they emerged from these problems and the same thing is going to happen to Macy’s. Some store closures were bound to happen. Dillards closed 3 underperforming stores either early 2007 or late 2006, but they have plans for opening of new stores too. Just give Macy’s a chance. GEESH!!! I’m not sure you’d want to use Dillard’s as a role model. The service is terrible, amny stores have gone neglected, and they really screwed-up some of their acquisitions (like Higbee’s in Cleveland, their northernmost stores). Their big innovation was centralized buying, which meant narrow, boring selections. They’ve been experiencing declines in same-store sales for a number of years. The smartest thing that Macy’s could do would be to avoid doing most of what Dillard’s has done. 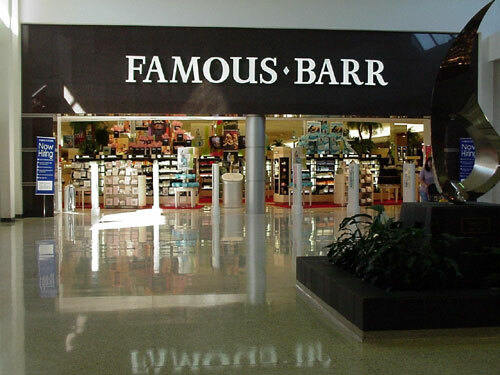 Crazy, when i read this i was remembered the extremely short-lived Famous-Barr that was at my local Merle Hay Mall (Des Moines, IA) and strangely enough, the picture of Famous-Barr included is that very one! Now THERE’S a dying mall…..
Macy’s is obviously still struggling, evidenced by the fact that its credit rating was recently ranked just one knotch above junk status. Although its been nearly two years, so many vacancies caused by the Federated/May merger still have not been filled. Certainly, one of the most surprising vacancies is the former Filene’s location in the Danbury Fair Mall. 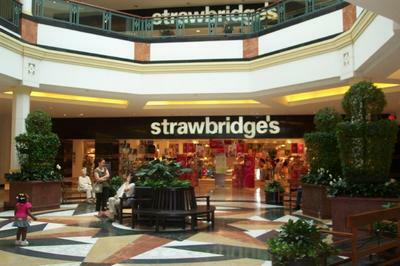 However, without a doubt, the most shocking vacancy is the former Strawbridge’s location at the Plaza at King of Prussia. Honestly, I thought that Boscov’s would have taken over that location by now. (The fact that they have not indicates that Boscov’s will probably never come to that mall.) I also think that the vacant King of Prussia spot would be a good place for either The Bon-Ton (a local PA-based chain) or Dillard’s (which currently has no locations in the northeast). Yet, these chains also have not expressed interest. Wrong on both counts! Bon-Ton actually is in more than Pennsylvania and has slithered through other markets using Elder Beerman, Carson Pirie Scott, Younkers, Herberger’s, Bergner’s, and The Boston Store. And Dillard’s has a store in the very huge Natick Collection. Jonah, please forgive me for my rudeness, by Dillard’s does not have a store at Natick Collection. The six anchors at that mall are JCPenney, Lord & Taylor, Macy’s, Neiman Marcus, Nordstrom, and Sears. I do realize that The Bon-Ton owns all of those nameplates that you mentioned. However, the corporate headquarters is in York, PA. Among stores that just go under “The Bon-Ton” nameplate, the vast majority of them are located either in PA or upstate NY. Look, is Macy’s doing something right? The damage is done nonetheless. Will step foot into Macy’s when Hell freezes over. I am a tried and true Chicagoan and miss Marshall Field’s. I consider any Chicagoan who dares to patronize Macy’s a traitor to his/her heritage. I used to shop at Macy’s online. I used to shop at Marshall Field’s in person. No more. This is one customer Macy’s lost twice over and will not get back until they bring Marshall Field’s back. Real Chicagoans do not forget. Footlocker and JCPenney are still very much around. I am sick of macys Filenes was much better. I would love Dillards or Belk to come North. THE only decent stores i like are Lord AND Taylor and Kohls. Everytime I visit family in North Carolina I ALWAYS visit Dillards and Belks. Dillard’s , What a horrible store. Their merchandise is mainly private label. Their prices are higher than their competitors unless they have a clearance sale. They treat their employees like dirt and are not liked by most of them. Every time I go into their stores they have very few customers. I know they have closed alot of stores are probably will close more. Wanna do something for the 5 year Macy Takeover ‘Versary? It’s been five years since the Macypocalypse. And I still want my Marshall Field & Company back. Haven’t bought anything from Macy’s since then. @Brandon, i dont blame you i live in ny I hate Macys i still miss Filenes who was in the may dept store group with Marshall Fields. Sean, have you shopped in Macys lately. The quality of their merchandise is really horrible.Thats why Lord and Taylor is expanding into home furnishings and kitchen. Macys needs new vendors the ones Filenes used and better buyers.I am only agreeing with the guy he liked Marshall Fields and i liked Filenes. 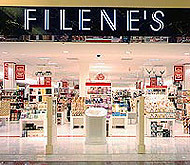 I never shopped at Macys when we had Filenes. so i shop KOHLS, LORD AND TAYLOR AND BELK AND DILLARDS ON LINE UNTIL I GET DOWN SOUTH. J.C PENNEY ALSO IS NOT THE SAME NOTHING DIFFERENT WITH THEM. WHATS WITH NO UPDATED INFO ON NANUET MALL SIMON LOVES TO KEEP THE RESIDENTS OF ROCKLAND WONDERING THATS WHY I DONT LIKE THIS CO. THEY ARE GOING TO PULL A FAST ONE ON THIS AREA I CAN FEEL IT. @rob, Check the spelling in my last comment to you, there’s a hidden joke in there & it went over your head. I don’t know what isgoing on with Nanuet, but as I type I am leaving Paula another voicemail to get back to me. In the vm, I also noted this web site & the page on Nanuet Mall. I haven’t shopped in Macy’s in quite some time, but I do shop in Kohl’s as well as LL Bean wich just opened in Paramus Park & will open in Yonkers next month at Ridge Hill Village. @SEAN, i SEE I THOUGHT IT WAS HECK IT WAS HECT FOR HECTS THAT WERE IN THE CAROLINAS. HAHA. GOTCHA. @SEAN, Well Sean there was an article in the journal news tuesday 9/13/11 that Nanuet Mall will be outdoor mall. They are still not in the definitive stage when the demolition will start. Now they are concerned how customers will reach Macys and Sears. In my opinon Macys should be torn down its an old building and will stick out like a sore thumb with the new.As i said we dont need Macys in Nanuet. What are they doing keeping it for a few old ladies in Normandy Village. @rob, How did Westfield shopping malls survive the recession? It was no accident that companies such as the shopping-mall developer Westfield survived the recession, said Eric Flamholtz, a management consultant who worked with that company. “Three words: It’s planning, planning, planning,” said Flamholtz, a management professor at the University of California Los Angeles. He spoke Thursday at a convention of the International Council of Shopping Centers, held this week at the San Diego Convention Center. An estimated 3,500 people were attending the event. It featured a trade exposition, “deal-making” opportunities and panels on industry trends, such as shopping centers tailored for Hispanic clientele. In the keynote address, Flamholtz discussed his past work with three companies: the shopping-center developers Westfield and Simon Properties, along with Starbucks. The international company Westfield has a strong presence in San Diego County through its ownership of prominent malls such as Horton Plaza as well as the UTC shopping center, which just kicked off a $180 million renovation. Simon Properties owns the Mall of America and San Diego’s Fashion Valley. All three companies “did relatively well” during the recession and came out stronger, unlike companies such as Borders that went bankrupt, he said. Their stories provide lessons for other business owners. Westfield, Simon Properties and Starbucks each learned from a past crisis, Flamholtz said. In Westfield’s case, the company ran into trouble in the late 1980s because the owner, Frank Lowy, unwisely purchased an Australian television station with management problems. “That was a poorly planned diversification,” he said. The stock market crash of 1987 slashed the value of both Westfield’s real estate capital and its media stocks. “Lowy learned: Never bet the company… Always do your homework,” Flamholtz said. As a result of that crisis, Westfield changed the way it did business. It’s now known for “extreme due diligence in deals,” Flamholtz said. Its legal team pores over every legal document and lease associated with a center. Other divisions review financial records and projections. The biggest mistake that company leaders make is focusing too much on products or getting “hooked on the adrenaline of making deals,” Flamholtz said, at the expense of strategic planning, leadership development and attention to corporate culture. 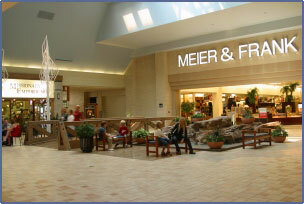 @SEAN, Well Westfield owns alot of strong popular malls in good locals especially GARDEN STATE PLAZA. Not saying they have had stores come and go in the mall it self but if you have strong ancchor stores like NORDSTROM, LORD AND TAYLOR ,JC PENNEY MACYS MOST MALLS WILL SURVIVE I DONT KNOW HOW MEIMAN MARCUS SURVIVED SIMON PROPERTY , PYRAMID HAS GONE THROUGH ALOT OF SHAKY MOMENTS POUGHKEEPSIE GALLERIA CRYSTAL RUN AND PALISADES HAS GONE THROUGH MANY STORES AND ANCHOR STORES,FILENES JORDAN MARSH STEINBACH, STERNS ABRAHAM AND STRAUS STREAMS OF ALL OF MACYS MORE SO BECAUSE OF FEDERATED MERGING STORES AND FEDERATED BUYIN MAY DEPT STORES. @SEAN, THATS ALSO NANUET MALL AS WELL.SO I BELIEVE THE ECONOMY DIDNT AFFECT THE MALLS TOO MUCH IT WAS ALL OF FEDERATEDS DOINGS . IF NANUET DIDNT LOSE STERNS OR ABRAHAM AND STRAUS I THINK NANUET WOULD HAVE SURVIVED MANY MIDLLE CLASS AND OLDER PEOPLE LIKED STERNS. SIMON WAS THE CULPRIT WORRYING TOO MUCH ABOUT ABOUT BUYING OTHER MALL COMPANIES AND TAKING CARE OF THEIR CROWN JEWEL MALLS THE WESTCHESTER AND ROOSEVELT FIELD. Westfield has it’s share of problematic properties just like Simon & GGP. In the past few years they sold all assets around St. Louis to CBL & is now trying to sell an aditional 13 US malls to raise capital. I posted the artical on this site. Must I rehash the issues reguarding Nanuet Mall again? I went over them several times on that thred, & there’s no doubt that the Macy’s & Sears stores are both in rough shape. The worse part is that they are owned buildings & not leased. Now what’s worse Nanuet Mall or the performance of the New York football Giants against the Washington Redskins last sunday. @SEAN, Simon i read wanted to take the property from macys and macys refused them.Macys likes to waste money so they dont have to give people who take a job with them or who works for them get paid terribly thats why they are always hiring they are the worst to work for.Like you said in the past we are squeezed between westchester and bergen counties there is no need for two macys so close especially that a mall is being demolished and now they are worrying how customers will get to macys and sears during the demo and construction.Also Sears may not be around in 2012 if they get rid of S ears. It depends where Westfield malls are that had problems in locations located. In popular areas such as paramus nj massapequa etc they will survive. Sunrise mall in Massapequa IS A WESTFIELD MALL IT has been around for years and survived many stores comings and goings GERTZ MAYS ABRAHAM AND STRAUS NOW THEY HAVE MACYS JC PENNEY WALMART ETC. @rob, Sunrise at one time was owned by GGP. The large retail REIT’s despite good returns as of late are in property dispossition mode. They are dropping properties that are weak to raise capital for better assets further down the road. Real estate companies do this all the time, but do to tight credit, property sales are the best way to raise money quickly. One of the other issues is if a property doesn’t have potential, the furms will put it on the market to see what kind of interest gets generated such as the potential Westfield sale I mentioned above. If ALL of the REIT’s sold the weakest 25% of there properties, ballence sheets would be much stronger. Not only that, it would give local developers the chance to redevelop these properties into something the community could benefit from. In Washington state, what’s now Macy’s used to be Bon Marche.